This Halloween the Paw Patrol is sure to be keeping an eye out when the trick-or-treaters hit the streets cruising for candy, and they might be filling a few sacks full of treats too! When Chase is out on patrol, a set of trusty wheels can really come in handy when a call from Ryder comes in. If you have Paw Patrol pup in the house, this tutorial will help make sure they are the first on the scene this Halloween. This DIY police car is the perfect accessory for the Chase costume. The required supplies are basic, and we’ve templated out the decals and parts. Follow along and get ready to hit the gas! 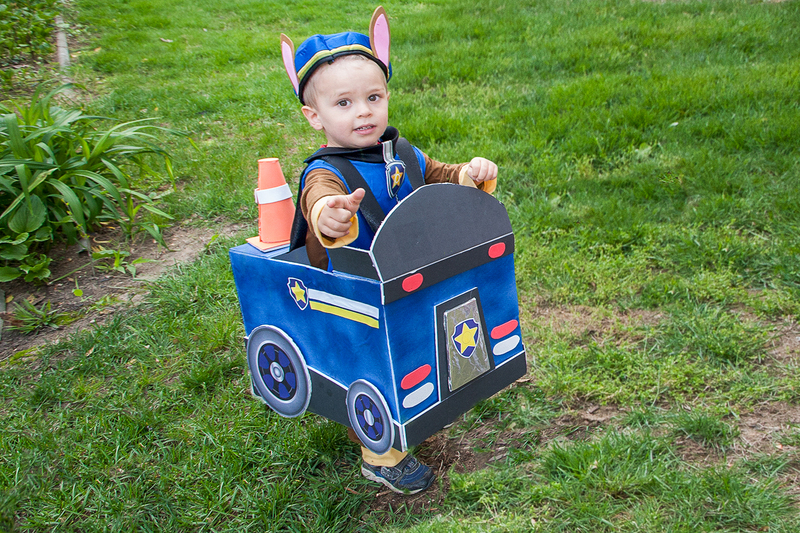 This police car costume was designed to fit a 2.5 year old. 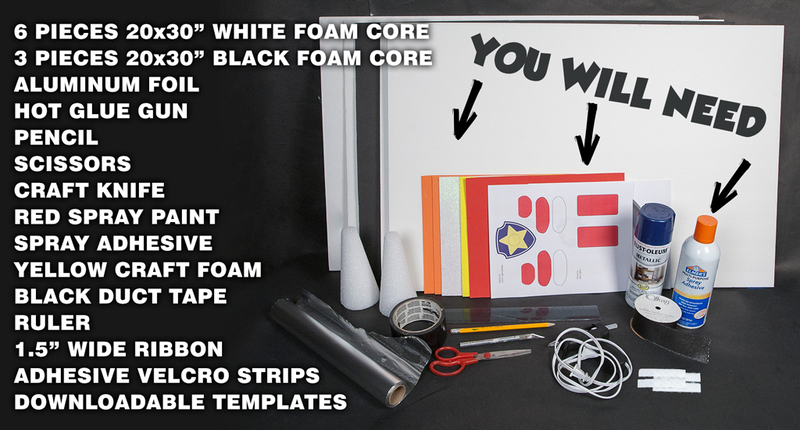 You can adjust the overall measurements of the foam core pieces slightly as you go to fit a larger child. 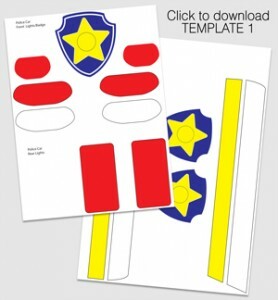 The template pieces will still look good even if the body of the police car is slightly bigger. Don’t worry. 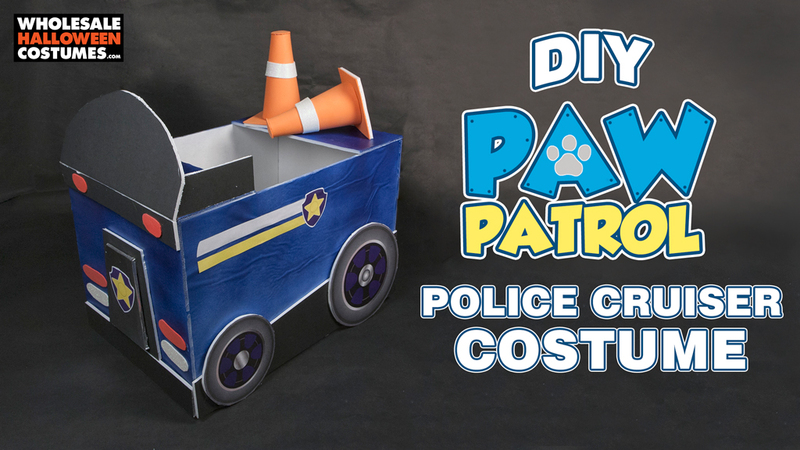 If DIY just isn’t for you, browse all the Paw Patrol costumes over here to save yourself a little time and effort! Step 1. MAKING THE POLICE CAR- Cut white foam core into the following size: two pieces 12” x 12”, two pieces 12” x 18”, two pieces 12” x 5”. Step 2. Hot glue the pieces together as shown to form the body of the police car. Step 3. Lightly spray paint the police car metallic blue, and let dry. Step 4. 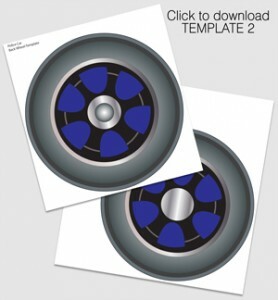 Cut out the template for the front of the police car. Using the grill template, trace and cut the large grill out of black foam core, the small grill out of white foam core. Trace and cut the small lights, and one set of large lights out of red foam, and one set of large lights out of the glittery white foam. Cut two pieces of black foam core 12” x 2”. See the photo for reference. Step 5. Wrap the small grill in aluminum foil. Step 6. Tape the foil on the back and smooth out the front of the grill. Step 7. Attach the pieces to front of the car, as shown. Use the hot glue to attach all the pieces, except the badge. Use the spray adhesive to attach the badge to the grill. Step 9. Cut out the stripes and badge from the template. Cut a slanted piece of black foam core, 12” wide, 5” on the right, slanted to 2.5” on the left. Step 10. Hot glue the slanted piece on the bottom edge of the car, as shown. Hot glue the wheels on the slanted piece. Use the spray adhesive to attach the stripes and badge. Repeat the steps on the opposite side of the police car. Step 11. Cut a rectangular piece of white foam core 8” x 5” and wrap in foil. Step 12. Rip thin strips of black duct tape and place them horizontally on the foil, as shown. Step 13. For the back of the car, cut a black piece of foam core 12” x 5”. Using the template, trace and cut the back lights from red foam. Step 14. Hot glue the pieces on the back of the police car. Step 15. 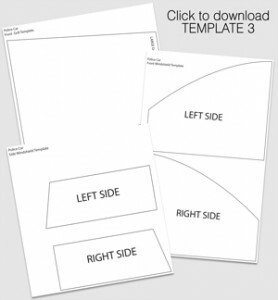 Use the template to cut the windshield pieces out of black foam core. Step 16. Hot glue the windshield to the police car. Start by gluing the side pieces on, with the angled part facing the front of the car, then attach the front windshield, gluing it to the angled side pieces so it’s more secure. Step 18. Hot glue the orange foam square to the white foam core square. Wrap the cone in the orange foam, top with the circle and hot glue to the base. Step 19. Cut the stripe from glittery white foam and glue the stripe to the cone. Step 20. Hot glue the cones to the back of the police car, as shown. Step 21. ATTACHING THE STRAPS- Use the craft knife to cut two small slits in the front/top panel of the police car, as shown in the photo. The slits should be just wide enough for the ribbon to slide through. Step 22. Cut a piece of ribbon, approximately 45” long. Slide the ribbon through the openings from the top. Attach one part of the adhesive Velcro to each end of the ribbon. Step 23. Attach the other part of the adhesive Velcro to the underside of the back top panel. Step 24. When done, the straps should be approximately shoulder width apart and the Velcro straps can be adjusted when the costume is being worn. Beware, this costume might get a citation for exceeding the cuteness limit!! If you’re going to be sending the patrol out on Halloween in your own DIY cruiser, share the pics with us on our on Facebook, Twitter or Instagram using #WHCostumes.